Been a part of several albums in #Bhojpurilanguage, singer #PunitAnand will soon be a part of #Bollywoodmovies in a grand way. While sharing this news with the media he also added "I want to be Salman Khan's playback voice and want to sing a special song for him and this is my goal in life. 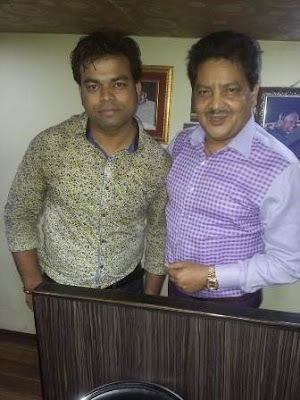 I consider Sonu Nigam and Udit Narayan as my idol and have learned a lot from them." Punit is trying his best to leave a mark in singing with his talent and achieve his goal. His singing innings have been quite interesting and the talented singer has been singing ever since his childhood. Participating in various talent shows across school and college only made him realize that one day he will achieve his dream to be a part of Bollywood. Punit came to Mumbai in 2012 and got his first break in a Bhojpuri album which was launched by India's topmost music company T-Series and the album turned out to be a successful venture for the singer. After the success of the album, he made around 14 albums back to back including devotional songs, motivational songs, and many other hit numbers. The singer with his good work only believes that nothing is impossible in life and only the right path will take him ahead.